Parents affected by the Mortonhall crematorium scandal were not told that ashes were left after their babies were cremated because it would have been "too distressing", a report has said. 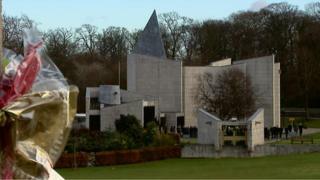 Staff at the Edinburgh crematorium buried baby ashes in secret for decades. Parents were told there were no ashes left when young babies were cremated. The report described the practice as a "great tragedy" that left some parents facing a "lifetime of uncertainty". Media captionDorothy Maitland, whose baby's ashes were disposed of by Mortonhall Crematorium, says: "I'm just not sure that my daughter's ashes are there". The families of more than 250 dead babies were affected by the scandal. Dame Elish - a former Lord Advocate - said managers at the council-run crematorium knew that ashes were left after babies were cremated. But parents were not told as managers believed it would have been "too distressing" for them, she said. The inquiry found staff had asked the council for a baby cremator to be installed but were told this was not financially viable. They also said that baby ashes were cremated in the evening when incinerators were cooler, and any ash found in the morning "would be mixed in with the first adult cremation in the morning." And Dame Elish said it was not known for sure what remains of which babies were interred in an unmarked "garden of remembrance" at Mortonhall due to a "longstanding and wholesale failure" to keep accurate records. The scandal of Mortonhall can be summed up by one line, on page 536, of Dame Elish's vast and comprehensive report: "There is overwhelming evidence that foetal bones do survive cremation, at least from 17 weeks gestation." So, what was the point? Why deprive grieving parents of the truth about their babies' remains, and the chance to say goodbye properly? "Inertia," according to Angiolini. The fact is, staff at Mortonhall simply didn't bother trying. Funeral directors and the NHS failed to question the practice. Edinburgh Council failed to adequately supervise. Dame Elish's report pulls no punches, and will also make uncomfortable reading for Hazlehead Crematorium in Aberdeen which claims it doesn't get ashes from babies up to 18 months old. She makes urgent recommendations for changes in practice, and in law, which has implications for the national review being carried out by Lord Bonomy. But Dame Elish was unable to definitively answer the question on each affected parent's lips about the final resting place of their baby. They, she concludes, "will now be left with a lifetime of uncertainty about their baby's final resting place". They have been failed by the people and organisations in whom they put their trust, at the most grief-stricken time of their lives. And that's something that can never be put right. The report, which runs to more than 600 pages, stated: "The great tragedy of these events over many years is that many parents will now be left with a lifetime of uncertainty about their baby's final resting place." Anne Grannum, the superintendent at Mortonhall until 2011, was described consistently by staff as utterly devoted to her job but wholly consumed by efficiency and averse to change or suggestions for change, the report said. Ms Grannum was perceived as demonstrating little compassion by many of the parents, it added. The report said: "The extent to which practices in the cremation of foetuses, stillborn and neonatal babies at the Mortonhall Crematoria have failed to reflect the changes over the years in social attitudes and the corresponding need for greater care, sensitivity and transparency is partly a product of an inward-looking and isolated managerial approach at the operational level. "That situation was allowed to persist because of an absence of meaningful supervision or leadership from senior management on this matter. "Staff employed there for many years largely adopted practices and beliefs formed and fixed over several decades. "They worked for many years under the direction and supervision of the same superintendent who also preserved such opinions. She was a manager with a lively concern for efficiency and cleanliness but an apparent aversion to change." The report said the apparent belief at Mortonhall that the bones of foetuses and even stillborn and neonatal babies could not survive the cremation process continued, despite evidence and information to the contrary. But there was "overwhelming evidence" that bones from foetuses as young as 17 weeks do survive cremation, Dame Elish's investigation found. The report, which was compiled for the City of Edinburgh Council, contains 22 recommendations which will now be taken forward by the council and other relevant agencies. The Scottish government should commission research to identify best practice in "achieving remains in the cremation of foetuses, stillborn babies and neonatal babies". Crematoria should not be allowed to continue with cremating such infants unless they can demonstrate competence in "achieving remains and show consistent evidence of the sensitive treatment of next of kin"
The City of Edinburgh Council should "review the manner in which the crematorium is managed in the future"
There should be "robust systems of audit and inspection" to ensure safe working practices and "quality of service" to bereaved families. Sue Bruce, chief executive of the City of Edinburgh Council, said: "On behalf of the council, I would like to offer my sincere apologies to the bereaved families for the distress they have suffered as a result of the practices at Mortonhall Crematorium. "I realise that the past year-and-a-half has been very difficult for the families involved and wish to thank them all for their co-operation with the investigation and their contribution to the report. "It is also clear from the recommendations that there are far-reaching implications regarding cremation practices and the legislative framework not just for Edinburgh but across Scotland and the United Kingdom and I will be working with the Scottish government and other relevant bodies to address these concerns." Ms Bruce said the council would now consult with families regarding their views on a suitable memorial. She added: "It is vital that we learn from this and look to the future. We must ensure that the highest possible standards are adhered to at Mortonhall and that nothing like this can happen again." Copies of the report were couriered to parents on Wednesday morning, ahead of its release to the general public. A 41-year-old mother, whose son's ashes were buried in Mortonhall's Rose Garden without her knowledge, said she was "angry and upset" to hear managers had refused to tell parents there were ashes. The woman, who asked not to be named, told the BBC Scotland news website: "My stomach is in knots, I could vomit. I absolutely disagree that it would have been too distressing to find out our babies had been cremated. "It would have helped us if we could have taken the remains of our wee boy and disposed of them in the way we decided. "It is the basic right of a mother to be given enough information to make an informed choice and we weren't given that. "We were led to believe there would be no cremation and told to tick a box." The mother does not know if a further two babies she lost are also in Mortonhall as an investigation concluded there was "insufficient evidence" - meaning there were no records of what happened to them. Several parents have called for a full public inquiry to be carried out into practices surrounding the cremation of young babies. Speaking at a media conference in Edinburgh later on Wednesday, Patrick McGuire, a partner at Thompsons Solicitors, which is representing the families, said: "The families only ever wanted the truth and answers. "The families care that lessons are learned from this so that nobody has to go through what they have had to go through. "By the time all the truth has come out there won't be a single community that has not been affected by this and the families are entitled to recompense. The report has been very helpful on this front as it has recognised the families' concerns." Gary McDougall, whose baby son Fraser died after been born prematurely at 23 weeks, said: "The report is damning of City of Edinburgh Council and of the practices at Mortonhall. What they have done to the families is an outrage and a scandal. There needs to be answers over what has been done." The practice at Mortonhall crematorium is thought to have been in place from its opening in 1967 until a change of management in 2011. Media captionMadeleine Cave says she will never know daughter Megan's final resting place: "I don't have any hope"
A separate inquiry into how infant remains have been dealt with throughout Scotland is expected to report at the end of May. Former high court judge Lord Bonomy has chaired the Infant Cremation Commission, which will recommend changes to the law to prevent a similar scandal happening again. Public Health Minister Michael Matheson said: "I am clear that no parent should ever have to go through a similar experience to those affected by practices like this, at any crematorium in Scotland. "We are absolutely committed to changing the law and a wide-ranging bill is already planned. On that basis we established the independent commission, chaired by Lord Bonomy, to examine current infant cremation policy, practice and legislation. "Lord Bonomy has advised he expects to deliver their national recommendations to ministers by the end of May. These recommendations will shape and inform the work of our planned legislation."